For the life of me, I cannot understand these feelings. I have been using the “New Search” since its debut a few years ago, and find it far superior to the old search engine. I can only suppose that the problems stem from unfamiliarity with the more powerful settings. I will admit that this does look quite unbearable to use. However, you will notice the “Show Advanced” link at the bottom, next to the “Search” button. When you click on this link, the appearance of the search box changes dramatically. Wildcards (* or ?) will not work with any of these options. They only work when “Restrict to exact” is active. However, these options do allow for more flexible searching, without requiring wildcards. On first name, for example, a search for Anna with the “similar meaning or spellings” box checked will also return Ann, Anne, Annie, Hannah, etc. Another complaint with “New Search” is that the results seem random. This is also a quick fix. Here you see that the results from numerous record groups appear. However, you can change the results to appear by record group. This is particularly helpful, for example, if you know that the person you are searching lived from 1863 through 1921 in New York. You can use a little genealogical reasoning to skip the record groups before 1863 and after 1921, and those that do not concern New York. You can then go through and select each potentially relevant record group one-by-one. This, of course, limits the results to those in each individual record group. You can also make changes to the specific search terms within each record group. Just use your browser’s “Back” button to return to this main search results page to access other record groups. I hope that this brief tutorial helps those who are having problems, and I welcome any questions, if I have not addressed any other issues with “New Search.” I believe that you will find–like myself–that the current search engine is far superior to the “Old Search” that everyone seems to love. Michael, Like you, I really like the new site. I have a much higher confidence level that I am getting what I am searching for. I didn’t know about the “sort by collection” feature. I have been using the home page to access the specific collection. Thanks for the tip! Hope all is well with you. I don’t use the Ancestry search feature as a stand alone option. I do it from within the Family Tree Maker 2012 program. My “hints” or “shaky leaves” are far more accurate with the “new search”. My Hints are ones I need to follow up on. I have about 1,800 of them. Of those 1,800, most of them will be appropriate. From the best that I can tell, is the “other” data that is sent from FTM2012 to Ancestry OR from the Ancestry Member Tree to Ancestry. (for the most part, the SAME ‘hints” are in both places. The difference is that “other” data. Relationships, Dates, and Places. That additional data will bring out the “low lying fruit”. The Quick Hits, and from what I have seen, better results. Getting back to what you posted, I think that when you get into the Advanced Search, and Add more data to your search “string” you will get 1) fewer hits, and 2) more likely results. 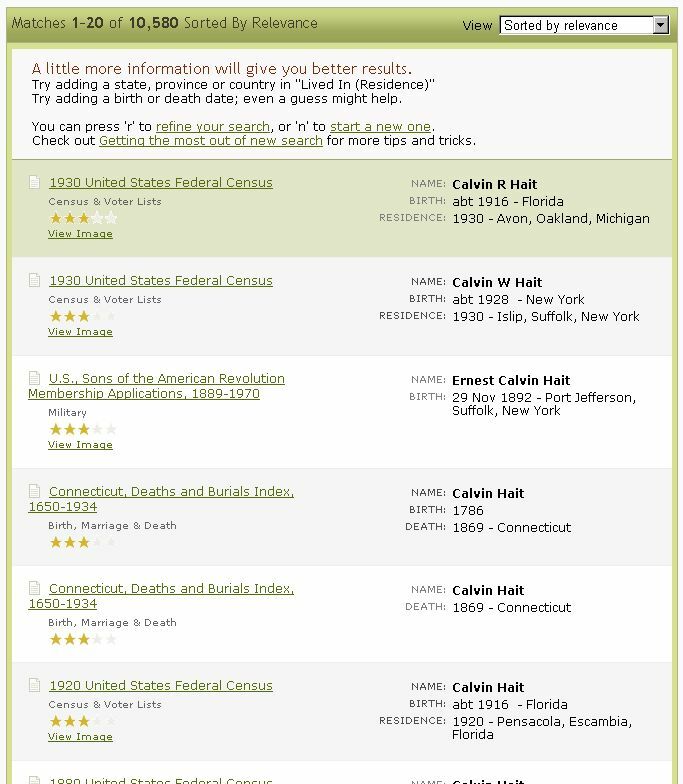 When I do use the Search feature on Ancestry, I’ll be looking at specific collections. For example, I wanted to find my grandfather’s Civil War unit’s history. Did a search for the unit name, and it was there. I know that isn’t helpful, but I think that the more data you provide, the fewer hits will be returned. I would NOT search that way on other websites. I search broadly, then narrow down, by adding the additional information. That link is on the http://ancestry.custhelp.com page, left column, under “How to search”. There are a couple of articles that you might want to look at. Again, for me, I Search differently on Ancestry, then I do on other websites. For example, yesterday, I was searching on GenealogyBank. I had to remember where I was, searched broadly (less “stuff” in the search), then narrow it down, but Record Group, or by Location. Thank goodness it’s not just me. Sometimes it seems that every mailing list is full of those who regard the New Search as only for children. (Possibly slight exaggeration here… Possibly.) What made me switch to New Search was the ability to do phonetic matching on surnames as Soundex seems to catch distinctly odd names. Phonetic isn’t foolproof but seems to give a better hit rate. Wildcards are still useful occasionally but I have to think a bit more about them. For names, I tend to use First names set to “Names with similar meanings or spellings” and last name set to “Phonetic matches”. It’s worth noting that while these are supposed to be sticky settings, nevertheless they seem to revert to Exact-only at the drop of a hat – often when expending the collections to search and usually without me noticing. First names set to “Records where only initials are recorded” I tend to use mostly for the US census – the UK used full names almost exclusively; what was it with all those American entries with just initials? (all of which you mention). And I think that you are not alone. Personally, once I discovered all of the various settings, I found the “new search” far more powerful. I think the biggest problem is that Ancestry does not default to the most powerful way to use the search engine, so many genealogists give up before trying it out. I’m not convinced it’s all that more powerful than Old Search, which they will have to pry from my cold, dead hands. Old Search continues to serve me well, and is faster and easier to use. Yes, I realize New Search will become “faster and easier” the more often I use it, but I’m not planning to do that regularly until I’m forced to. I do go to New Search periodically and try it out yet again, but have yet to be convinced. As a New Search power user, I partly agree with you Connie. The fact that search settings don’t “stick” is super annoying. Also, with a lot more options comes a lot more clutter on the screen. I would love it if I could choose whether my results defaulted to Categories view rather than Relevance view. Clicking it every time is also annoying. The search results interface is definitely less “clean” than Old Search. On the other hand, New Search is very much more powerful than Old Search. Like any other tool, it just requires breaking out of your comfort zone and spending the time to learn. It took me about a week of playing with New Search options to get really comfortable with it. Since the old way is going away, I’d recommend working on it now so you have time to compare and contrast and learn. I personally would like to have the option of the New Search search screen that Michael described above, but with the cleaner results pages from the old system. New Search is of no use for those who research in the Virginia counties that became West Virginia in 1863. For instance, I cannot use New Search for any census before 1870 for a county that became West Virginia. New Search forces you to choose the county name as a WV county, and returns only results dated after WV became a state, except for the 1850 and 1860 Mortality Schedules. Also, since New Search only allows us to pick a location from a drop down list, and misspellings of city or county names are a reality — New Search results miss all those records which have misspelled localities. For instance, in the census indexes, there are county names misspelled in certain years. The only way to include the misspellings in search results is to use Old Search utilizing wild card values in your search specifications. When entering the location, simply select “Virginia, USA” and omit the county. Then, you can put the name of the county in the box marked “keywords.” This will bring up the results that you want, in these counties. If a county name is misspelled in one of Ancestry’s indexes–a rare occurrence, but it does happen–you can find the misspelling by using the “browse” function rather than the search function to find out how they spelled it, and then put that name in the “keywords” box. And of course, you can add a misspelled county name to the Ancestry Errors Wiki so that other researchers will be aware of the problem and can plan their search around it. Thanks Michael, I just tried your suggestion of putting the county name in the keyword file, but this doesn’t provide the actual census records. All it gives you in the results for years prior to 1870 is access to an old compiled index of a range of census years. You still cannot access the actual census images from New Search. I have spoken to Ancestry tech support, including supervisors, and they agree that there is a problem with WV counties prior to 1870 in New Search. Also, there are now some of the WV records disappearing from search results through Old Search, including Census Mortality Schedules. Recently I reported one of the county misspellings for census records to an ancestry supervisor, and the correction showed up on Ancestry very quickly. I get different results when I try to search for West Virginia counties. I just searched for the name “George” (picked at random) with “Virginia, USA” under “Any Event,” and “Barbour” under “Keyword.” I received results in Barbour County, Virginia for both the 1850 and 1860 U. S. Censuses. Barbour County, West Virginia, was established in 1843, so no earlier results are to be expected. I did the same search with “Hampshire” (est. 1754) in the “Keyword” box, and received results for the federal censuses from 1810 through 1860. I am not sure why you are not getting the same results. Maybe this should be the subject of a separate post, so that I can include screen shots. Michael, this morning I tried again using your suggestion of putting the county name in the keyword field, and this time succeeded in seeing the results for pre1870 census records as well as military, vital records, etc. I haven’t a clue why the result lists did not show these items yesterday. This method of using the keyword field is a work around for VA/WV county searches, but it does include many extraneous items in the results list since I’m not searching specifically for the county, I’m searching anywhere for a keyword. If I use Old Search, the search result lists are clean and precise. Jane, your complaint is a problem that annoys me too. The main problem is that the place name authority that builds the drop-down place name lists is based on current places. It doesn’t include any defunct counties either. Michael’s workaround is the only way to deal with it until they find a way to create a place name authority that includes all relevant jurisdictions. 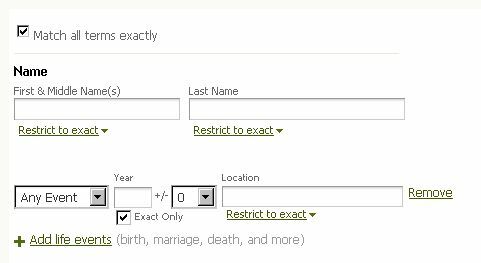 Considering this complaint was made several months ago and still exists leaves me to believe Ancestry does not have a solution or think we think the combo of the location and keyword fields is the solution. There have also been instances where the place name indexed for earlier census records does not match the place authority and it is not because it is a historical location. It is just a variation in how they put in the name. I also hate the place authority in that sometimes, it includes county after the county name and sometimes it doesn’t. You really should not have to look at what is going to show up in the list to determine what needs to be typed/selected. Then, while I use USA in my documentation, why do I need to have to use USA in a US Census search….a waste of time. Then the location does not always seem to stick…sometimes, I have to search twice for the same location. Now, with the stupid slider bar, 1/2 the time an exact search with location criteria does not stick. When the entry for the basic search criteria is that annoying to enter and unreliable, I can’t see that the new search is an “improvement” over the old search. I’m about ready to cancel my ancestry membership over this new search. For one thing, the results you get one minute might be different the next. I can’t tell you how many times I’ve done a search and noticed something as I was clicking on something else. Of course, since we can’t get back to search results once we click on a few links, we have to do the search again. And it will give different results every time. Very disappointing. I have not had this occur. I also have no problem getting back to the search results using the “Back” button in my browser. After you click through to a record, there is also a link on the top left (above the “Page Tools”) that says “All Results” … that will take you back to your search results list. Thank you for the heads up.One of the reasons I love genealogy is the willingness of everyone involved to help each other out. 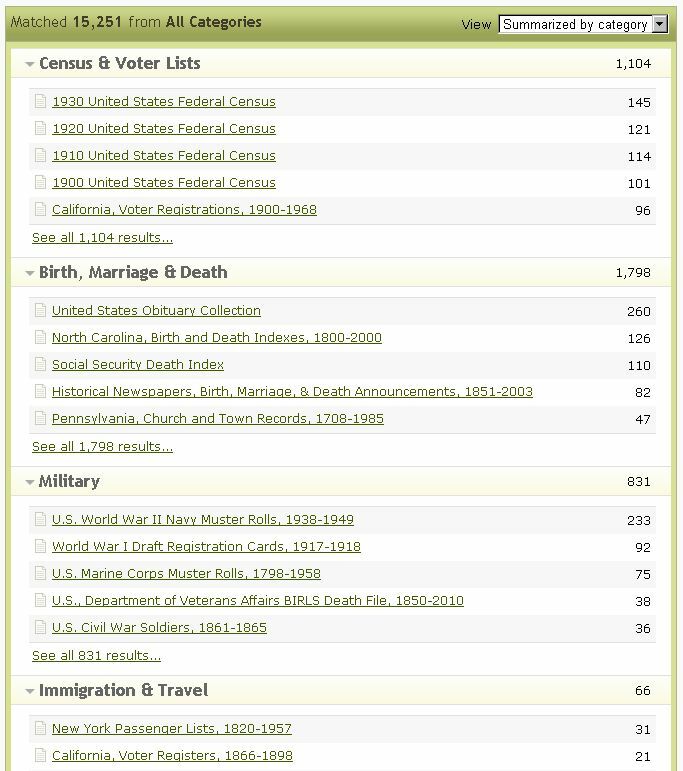 When I look at a census record, I usually go on to view the actual page and then I check the index and look at the people who live nearby (never know what surprise might be lurking in unexpected places) and then I frequently click on the suggestions that show up on the right hand side of the page. Once you do a few of those things, there is no option to return to the search results. Sometimes I remember to right click and open in a new tab and that really helps. I just need to remember better but my rememberer is getting worn out. I do not get as many important results with the new search. If new members were aware of it the would like it too. I just tried my Great Grand Father James Judson Ross. And got zero hits from the new search. I have used Ancestry for 14 years and I will discontinue my subscription if the old search is not an option. I wish you would work on the refining of some the search which have choices for difference categories but they are not functioning. I’m trying to keep an open mind but it’s very frustrating to search on John Doe who was born in Ohio in 1875 and died in Iowa in 1950 and have hundreds of thousands of hits with 99% of them being extraneous, like maybe George Dore who was born in CT in 1772. The old search gave me better and more meaningful matches. It does work fine if I know enough to fill in all the blanks as you suggest above but most of the time I don’t –that’s why I’m doing a search. Ancestry dropped the ball on this one! It is the most frustrating search I have used. No matter how specific and how many blanks I fill in and to search “Restrict to exact”, I still get results that contain names, places that are’nt even close. If I am looking for John Doe in Greene Co. MO , I don’t need every Jim Doe, Jack Doe, Mary Doe, in every darn state or even countries overseas! I restrict to U.S. 99% of the time, and still get all the same garbage. Refine search is a joke–if the first serch gav 25,799 hits, the refine search gets the same number. At least the old search would make it easier to add or subtract info, and I was never havng to wade through lists of people that had a name that sounds close, or a place that was’nt in the EXACT choice. What good is exact, if one does’nt get exact??? I have never seen this happen when using “exact” search. First, I might recommend checking the drop down menus beneath the first and last names as well as checking checking the box at “Match all terms exactly”. Here’s my experience: “John Smith” is probably one of the most common names in the US. I searched for EXACTLY “John” and EXACTLY “Smith” in Iowa, USA with a birth year of 1874 with “ZERO” years +/- and a death year of 1950 with “ZERO” years +/-. I received “ZERO” responses! I changed the birth and death dates to 1 year +/- and tried again. I received exactly ONE response. It was a Public Member Tree for John Smith born in 1869 died in 1951. But the point is this: I didn’t not get 25,799 hits from all over the world. I like the new search when used with patience and exactness. Sorry! Birth year 1870 +/- 1 year….My error!! Thank you for posting this, Michael. I know a lot of people don’t like the New Search, but I’ve been using it for years with no real complaints. New Search – Old Search – whichever. It’s STILL better (and cheaper) than going to the repository and doing it all by hand. It is the principal of it. 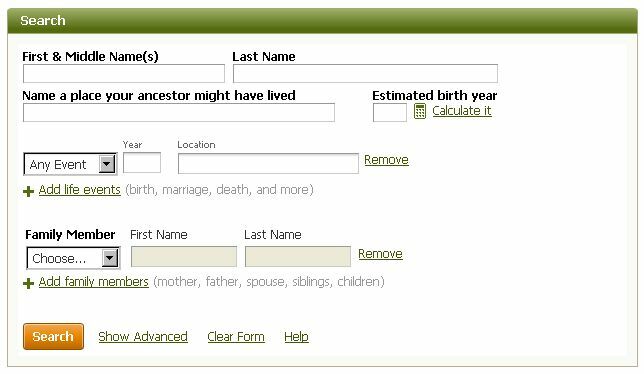 Ancestry had a decent search engine for which I was willing to pay a significant subscription price. The new search is poorly designed and tested search interface and engine. I am a retired software quality engineer manager so it is not like I am ignorant about using a new interface or seeing software faults. The key to my decision to bag Ancestry after 14 years is that a lot of the databases Ancestry uses are available for free elsewhere and on other subscription sites that don’t have the hefty price. There are also a lot of online sources that are not available on Ancestry so it is good to explore those as well. For most tasks, New Search works fine. However, it still cannot do a reverse search in many databases. For descendant research, I often search “U.S. Public Records Index, Volume 1” or “Volume 2” by address, or “U.S. Phone and Address Directories” by address or phone number, which are essential for finding spouses and birth dates. As long as the new search is unable to accomplish such a simple task, I’ll continue to use Old Search. Thanks for posting Michael. I actually like the new site-and will like it a bit better the more I use it. Michael, once again you have been able to clearly explain what is needed. This is not the first time you have done this, and I’m sure it won’t be the last. Change is not necessarily a bad thing. I, too, have been using the new search for awhile, and I just do not have a problem with it. As a matter of fact, it has enhanced some connections that I was stalled on. There are no words to describe the contempt I have for the so-called “New Search”; if I wanted 250,000 pieces of garbage, I’d ask for it. If I ask the the 1850 Census of California *exactly*, I don’t expect to get English baptisms from the 18th Century. New Search is worthless for me. This “example” of the 1850 census returning English baptisms never happens on the Ancestry site. Searching any specific collection only returns results from that collection. I just searched site-wide using the “exact” option for William Robertson who lived in California, USA. Every single result returned across all collections has some connection to California. If you’re not getting the results you expect, follow Michael’s instructions above. Well, Michael, I’ve come back to admit I wasn’t taking full advantage of the options open to me. I still like the old search better in terms of ease of use but I also realize I’m old and cranky and set in my ways and that sometimes I have to be dragged kicking and screaming into the new. 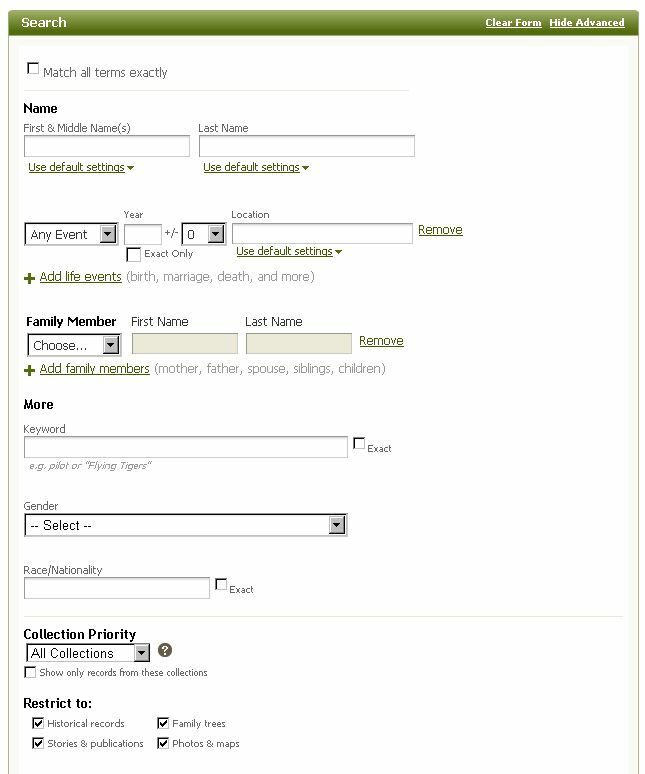 And I realize Ancestry has added millions of new records so they had to make a stronger engine to cope with it all and, choke, choke, the new search does give people more options. So I thank you so much for your article and for your patience responding to blockheads like me who complain. Happy hunting! Michael Hait is a well known, well respected Certified Genealogist (CG) who has appeared on many popular programs including “Who Do You Think You Are.” His post I felt was so well written, I felt that rather than rewriting the obvious, I’d reblog his post. I couldn’t agree more. I’ve been using “New Search” at Ancestry.com since it broke out about 2 or 3 years ago. I have no problem with at all. The latest tweaks simply make it better in my opinion. See what Michael has to say and the comments that should come along with the post.